Getting to Maybe: Pillow Fight! 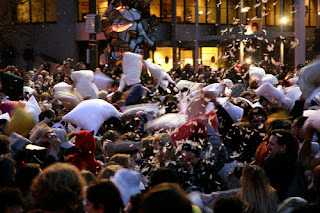 In San Francisco (Justin Herman Plaza) over 1000 people showed up to pummel each other with overstuffed pillows. This is looking like it is becoming a Valentine's Day tradition. Check out a lot more photos and videos here. next year, we're visiting San Fran just to particpate in this awesomeness! Heroes - Season 1, Episode 15 - Run!